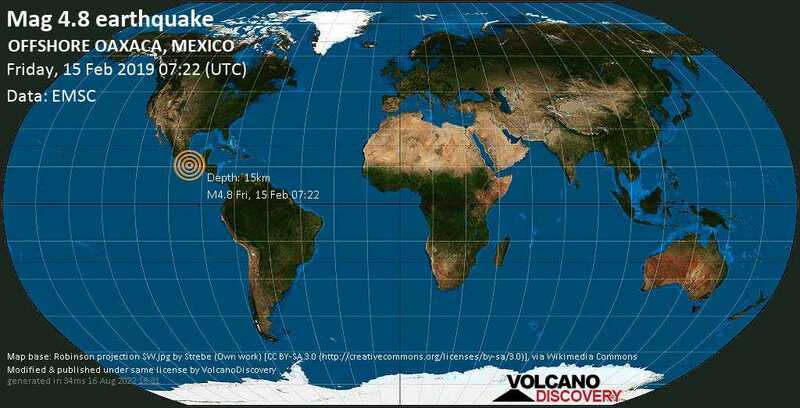 Feb 15 07:46: Magnitude recalculated from 4.4 to 4.8. Hypocenter depth recalculated from 27.0 to 15.0 km. Dreams Resort - Huatulco OAX / MMI III (Weak shaking): My wife and I were sleeping and it woke up both us. My bed moved slightly. Santa Cruz Huatulco Oaxaca / MMI III (Weak shaking): We were in bed and both woke up and asked if we felt that. Went back to sleep..